Here is an archive of the CSWA member guest blogs. 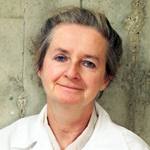 They cover a wide range of topics, some have been picked up by major international media outlets, others have become the subject of national news stories in Canada, and some have made the top science communications article lists for the year they were posted. If you are a CSWA member and would like to contribute a guest post just contact bloggerboss via email from the members page. This is hardly the first body of research pointing to the hazards of red meat consumption. As the respected Worldwatch Institute concluded some years ago, "The amount of meat in people’s diets has an impact on human health. Eaten in moderation, meat is an important source of iron, zinc, and three vitamins. But a diet high in red and processed meats can lead to a host of health problems, including obesity, diabetes, cardiovascular disease, and cancer." So our ruling politicians can hardly plead ignorant of the downsides. And now, even less so. This newest study, the most comprehensive of its kind yet, takes a step beyond past findings. "Most strikingly, impacts of (even) the lowest-impact animal products typically exceed those of vegetable substitutes, providing new evidence for the importance of dietary change." The research concludes that meat and dairy provide only18% of the calories and 37% of the protein we consume. Yet they require 83% of the farmland and produce 60% of all farm greenhouse gases. So, what's with this rush to expand, anyway? *Confidential briefing notes to the Manitoba cabinet last fall, obtained by Planet in Peril, expose just where the push for industry expansion is coming from. Was it coming from the Chamber of Commerce? Organized labour? Consumers? Grassroots voters? In other words, two big and already-prosperous Canadian food companies needed the government to help them find more pigs, so they could meet presumably spiralling global orders for pork (and fatten their bottom lines at the same time). 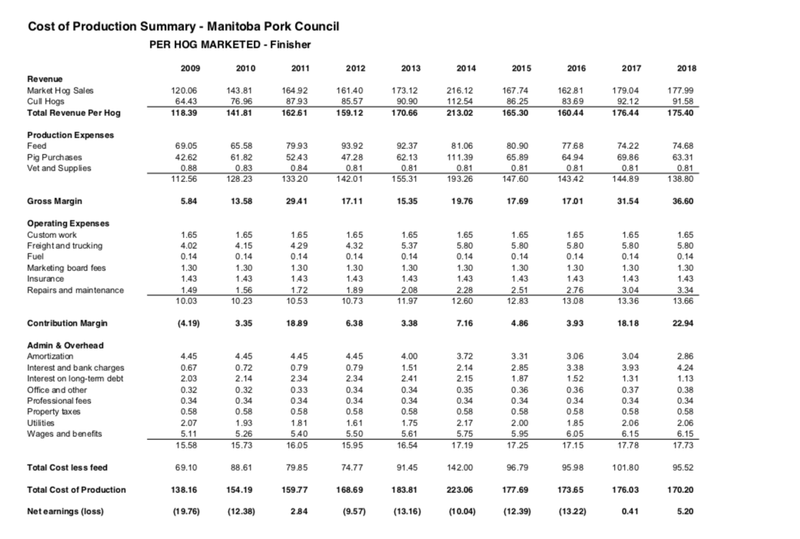 According to the notes, "Manitoba processors have indicated there's a 1.8 million pig shortage in slaughter capacity...this is equal to 285 new feeder barns and 1.8 million more hogs each year." 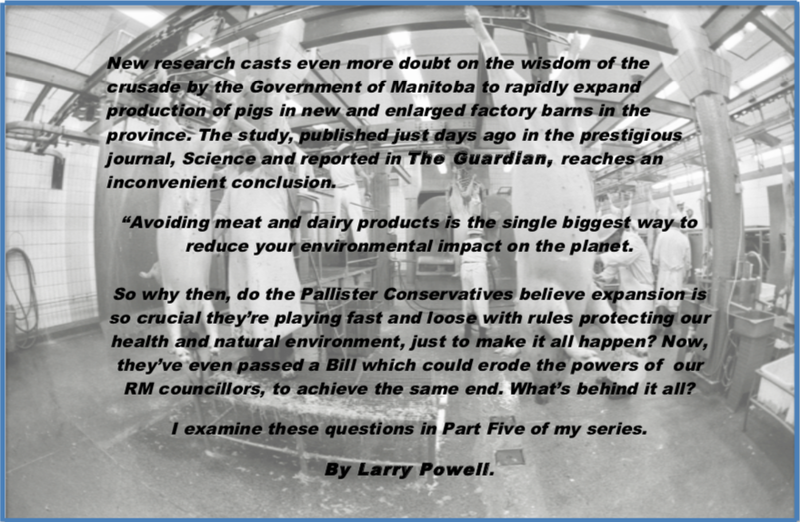 And, either through blissful ignorance or willful blindness of the massive harm mega-livestock operations have long been shown to cause, worldwide (please read my series, “In Hogs We Trust,” see links, below), the Pallister government now appears to be giving Maple Leaf and HyLife pretty much all they want! In its latest annual report, Maple Leaf describes 2017 as a “pivotal year.” Its adjusted operating earnings of $263.8 million were "well ahead of 2016." It completed the year with $203 million in cash. Shareholders were rewarded with $57 million in dividend payments, up 17% from the previous year. And its year-over-year share price increased 27%, outstripping the stock market, overall, by a factor of more than four to one. The HyLife killing plant in Neepawa. A PinP photo. The Japanese corporation, Itochu owns almost half of the HyLife operation. It's described as "a general trading company," second only in size to the giant, Mitsubishi. Are all sectors of the hog industry doing this well? 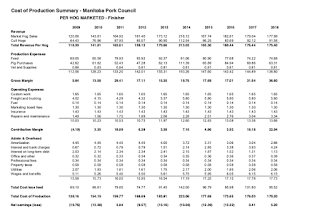 Figures from the Manitoba Pork Council itself, show the answer to that is “no.” The Council’s “cost of production summary” from 2009 to 2018 (l.), shows producers who’ve been finishing animals for slaughter, actually suffered net losses in seven of those ten years! They ranged from almost $10 per pig in 2012 to almost $20 in ’09. Even during the three money-making years, profits-per-pig ranged from just over $5 so far this year, to a razor-thin .41 cents last year! Is further environmental degradation already on the horizon? Last fall, the ruling Conservatives did away with the requirement that new hog barns include anaerobic digesters, or "ADs" (considered the "Cadillac" of devices to clean up livestock waste). They use microbes in the absence of oxygen to sanitize the waste and transform its vast methane emissions into usable power. A joint study by Manitoba Hydro and Manitoba Agriculture, found that ADs (rumoured to cost about $1 million each) were “not economically feasible” here. Yet, south of the border, the story is different. According to the U.S. Environmental Protection Agency, by the end of 2014, almost 250 such digesters were operating there. While most were on dairy farms, about 38 were being used on hog operations. While ADs are no long required in Manitoba, they’re not forbidden, either. Yet not one new hog barn proponent - apparently with lots of money to throw around otherwise - seems to have stepped up to volunteer to build one! Does this match the corporate rhetoric? Here is what the CEO of Maple Leaf, Michael McCain, says in his latest annual report. While Maple Leaf gets most of its hogs from independent producers, 40% are raised in its own barns. None of the existing ones are equipped with digesters. And, if any new Maple Leaf barns on the drawing board are set to include them, it's been a well-kept secret, so far. Recently, the sole owner of the Canmark hog operation near Roblin, announced a 14 million dollar expansion. While promising it would continue to be “environmentally friendly,” there was not a whisper of an AD there, either. 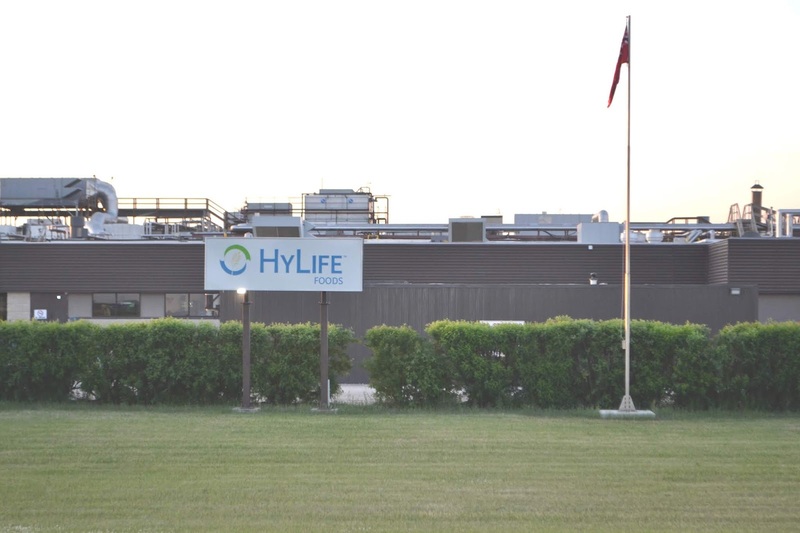 HyLife will build more than a dozen new barns on four sites near Killarney, alone. Any ADs planned there? It doesn't seem so. So, where does this leave us? Without a single working anaerobic digester on any farm in all of the province. Nor is there likely to be one for some time to come - if ever. Instead, Manitoba seems willing to settle for cheap, old-fashioned earthen manure lagoons prone to leakage, the kind that already litter the province. This is a legacy the Pallister regime needs to to “wear” forever - and not with distinction. Despite an online petition by Hogwatch Manitoba, signed by almost 18 thousand people demanding it be withdrawn, Bill 19 has just been passed into law by the majority Conservative government. As Ruth Pryzner warns, unless all rural municipalities are vigilant, and choose within a year to retain local control, Bill 19 will actually weaken the ability of their own ratepayers to appeal zoning by-laws. And there will be no process through which to object to new barn or expansion proposals in their neighbourhoods. The Bill will accomplish this by scrapping what used to be a mandatory public hearing process called Conditional Use. Once it is gone, RMs could be seduced into giving away the power to decide if a particular site is acceptable. They would no longer be able to make owners cover manure storage lagoons and plant shelter belts for odour control, or require hog factories to pay for road-building and maintenance! Pryzner says all of this threatens to “open municipalities up to uncontrolled and unlimited livestock growth. It changes the rules so that 25 people have to make formal objections to zoning by-laws to get a Municipal Board review. Immigrants and permanent residents are disqualified from participating. Imagine not being able to say anything about decisions that could harm your investment in a home, farm and community? Some 16 years ago, I personally protested when Canmark Family Farms and the local council tried - through a sadly secretive process - to set up a network of factory barns near Roblin, where I lived. It was partly because of that “conditional use process,” our citizens’ group was able to be heard. And the proposed project moved to another location. Sadly, the torrent of applications for new barns now pouring in, and being approved, promises to be nothing less than a recipe for even more unrest here in rural Manitoba in the years ahead. Is “hidebound” political ideology also playing a role here? Since Brian Pallister and his government came to office in 2016, one could be forgiven for labelling their policies as “ultra-conservative.” Despite the tragedy concerning the rail line to Churchill, washed out by extreme flooding and still not fixed, they've resisted a carbon tax (widely viewed as the most effective way of battling climate change). They've also taken a hard line on labour negotiations and health care costs, sold off crown assets and pretty much given up the very concept of "conservation," replacing it with a department formally called "Sustainable Development." And, on hog barn expansion, Pallister could well be playing from the songbook of Donald Trump himself. Both men seem to view any kind of regulation, (from the red tape variety to the enlightened kinds that can and do protect you and me from the excesses of corporations) with a knee-jerk hostility. Trump is convinced climate change is a Chinese plot. Pallister treats it as some sort of abstract threat and has come up with a lame "made-in-Manitoba" solution that gives the agriculture sector, a major player in greenhouse gas production, pretty much a free pass. Trump even issued an executive order some time ago, requiring that, for every new regulation issued, at least two old ones be identified for elimination! (Not much room for the merit system here!) And, if any regulation is deemed to be doing something other than greasing the wheels of corporate friends, it's future looks grave, indeed! Are there similar trends here at home? Consider Pallister's Bills 19 and 21 and decide for yourself! Footnote: I'm neither a vegan nor a vegetarian. But I do believe it's important to listen to the voices of science, even when they may be telling us what we don't want to hear. I'm a strong believer in compromise. So I try not to eat meat in excess. Neither do I believe it is helpful to flaunt being a carnivore as if it were a badge of honour. It's not. And my faith in humanity is restored when I see small-scale, family owned livestock operations which are part of the solution, not part of the problem. The world needs more of them. 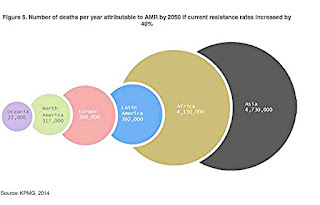 l.p.
Part#3 The consequences of animal diseases, worldwide. 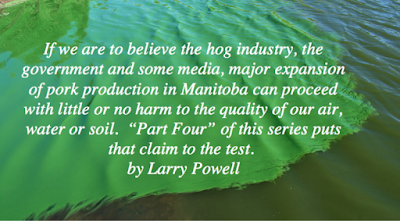 Part#4 The environmental impacts of an expanded hog industry in Manitoba. RELATED: A rebuttal to the findings in "Science" from the International Livestock Research Institute in Africa. 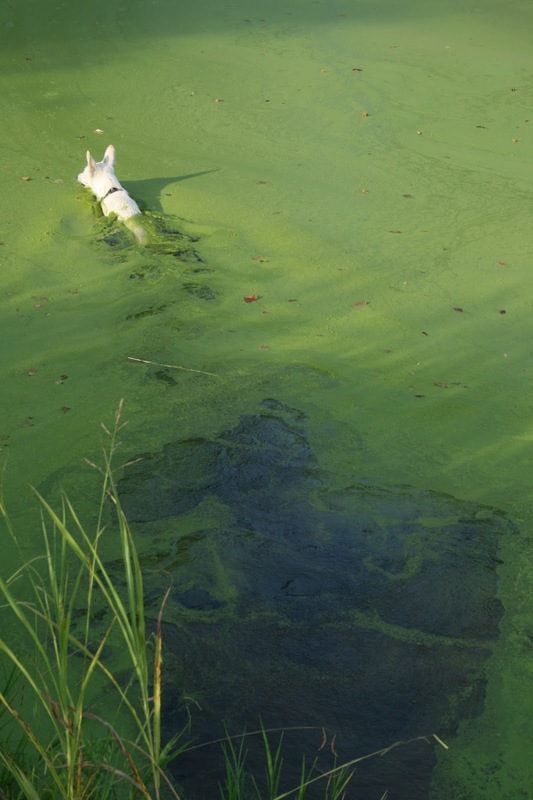 Photo: The growth of toxic algae explodes worldwide with the help of growing volumes of human and animal waste. more than 50 years before retiring in 2016.
have cited her work, as a building block for their own. The Brokenhead River flows into Lake Winnipeg, the subject of another study published in 2012. 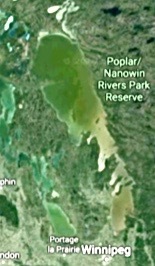 Entitled, “The rapid eutrophication of Lake Winnipeg,” it was conducted by a team of researchers headed by another water quality expert, Dr. David Schindler of the University of Alberta. It concluded that poisonous blue-green algae (cyanobacteria) “have nearly doubled in size in that lake since the mid 1990s,” thanks to rapid increases in phosphorous levels." Quite apart from the role big hog operations play in impacting water quality, is the question of usage - the volumes needed to water the livestock and clean the barns. The amounts are staggering. Figures on volumes already being consumed are hard to come by. But we are already getting a taste of what an expanded industry will look like. Applications are now pouring in for new barns and permission to expanded existing ones. The big pork processing company, HyLife alone, has applied to build no less than 16 big barns, housing some 50,000 hogs in the RM of Killarney, in the southwest. The company estimates all those barns, together, will require something like 48m imperial gallons, or 218m litres of groundwater per year! The hogs will produce well over 31m gallons of slurry, to be stored in several new earthen lagoons the company proposes to dig. The barns are to be located in the Pembina River watershed and built on land which is currently in crop production. 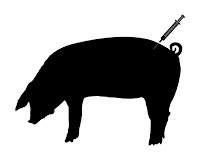 Part #1 Antibiotic overuse in Manitoba's hog industry. 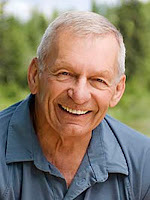 Part #3 The consequences of livestock diseases, worldwide and here at home. 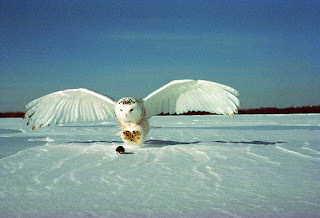 The beautiful Snowy Owl, like so many other wild creatures on Earth, faces an uncertain future. 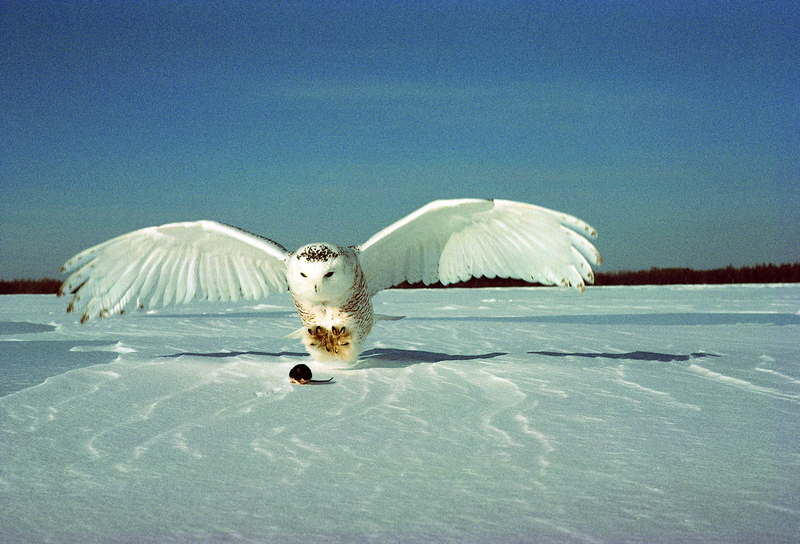 The “Red List,” a British agency, has just put the graceful, white bird of prey on the “vulnerable” list for the first time. Earlier estimates had placed the birds' numbers at as high as 200 thousand individuals, worldwide. Now, they've been revised drastically downward, to as low as 10 thousand! "Red List" been assessing the status of wildlife species for some 50 years. Is yet another of Earth's creatures headed for extinction? Photo: NOAA - C. Faesi / Proyecto Vaquita 1992. 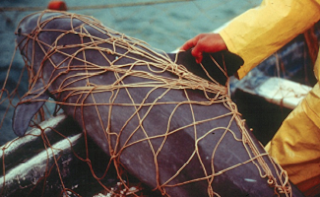 The National Oceanic and Atmospheric Administration reports vaquita numbers have declined an astonishing 92% since 1997. Gill net fishing is the main culprit. The vaquita have become “collateral damage” as poachers target a fish whose bladder brings a handsome price on the black market. A rescue team has been trying for some two years now to capture enough live animals to breed them in captivity, so their numbers can recover. But the vaquita have proven so sensitive to the stress of capture, two females have now died. And the rescuers have decided it's just not worth risking the lives of any more. So the effort has been called off with no plans for another. So where does this leave these vulnerable, intelligent, beautiful creatures? More alarm bells are being rung over drug usage in the world's intensive livestock operations. Will Manitoba listen? 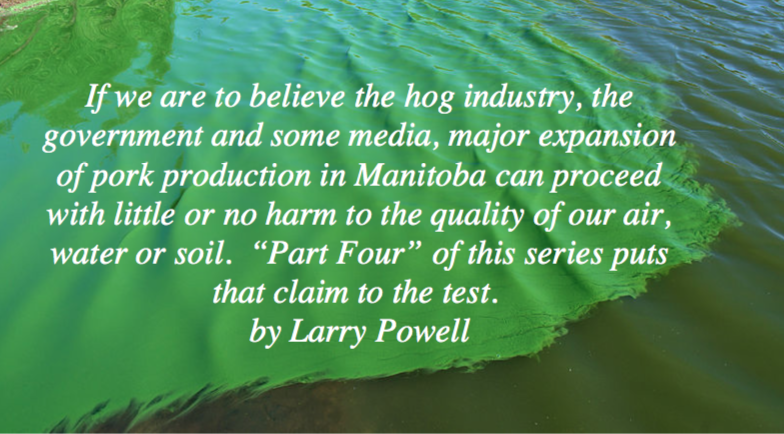 Larry Powell writes from SHOAL LAKE, MANITOBA. Tainted honey spells more trouble for bees. Are we losing the battle to save them? Three out of four samples of honey tested in a global survey released this week, were tainted with neonicotinoids, the world's most widely-used insecticide. A honeybee forages on canola. (Almost all of the canola in Canada is grown from seed treated with "neonics.") PinP photo. A five-member Swiss research team tested almost two hundred honey samples from every continent except Antarctica, for the five main compounds in the "neonic family" (acetamiprid, clothianidin, imidacloprid, thiacloprid, and thiamethoxam). Several isolated islands were even included in the survey. The levels detected were considered too low to pose a risk to people who actually eat honey. But, for adult bees, honey is their only food in winter and when flowers aren't blooming. While "neonics" may not always kill the pollinators outright, they've been shown to have "sub-lethal effects," which damage the way they grow, learn, fend off disease, navigate and reproduce. The test results show that "neonics" are now used everywhere, and that bees, probably including thousands of wild varieties, as well, are exposed to the toxins in their food, worldwide. "Neonics are suspected of being a key factor for a global decline not just in honeybees," states the report, "but in pollinators, generally. And, despite some recent efforts to decrease their use - the contamination (documented in this latest research), confirms the inundation of bees and their environments with these pesticides." And while "neonic" levels in the honey are considered low for human consumption, the research paper also hints - that may not be the end of the story. "There are increasing concerns about the impact of these systemic pesticides, not only on...honey bees ....but also on...humans." Other research has already implicated "neonics" in the declines of insectivorous birds such as swallows, probably by depriving them of the bugs they normally eat. Another study demonstrates negative effects on the rare Japanese crested ibis. 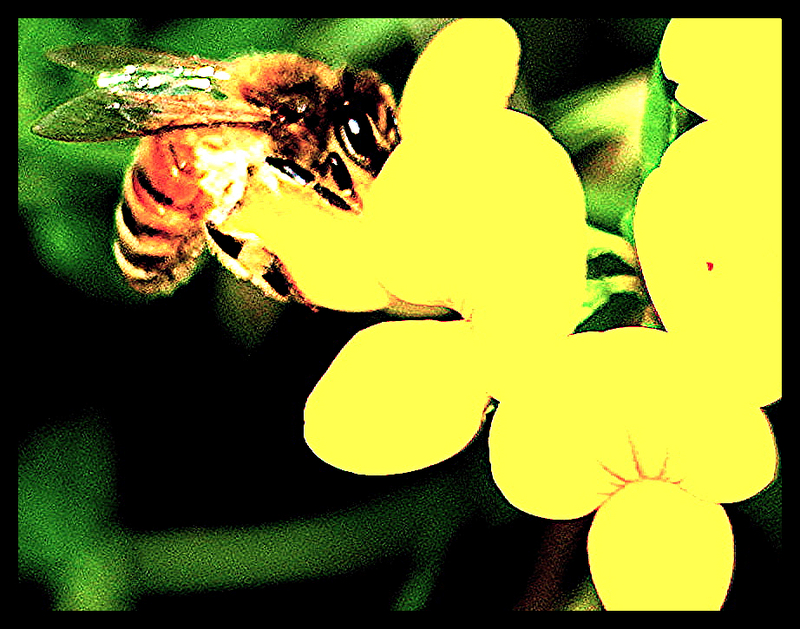 It was found to have better breeding success when "neonics" were removed from its environment. Obviously, the concern here is, if the consequences of "neonics" can "jump" species barriers, how long can we rule out potential harm to other vertebrates, including we humans? In Canada, three kinds of "neonics" have been detected in our waterways at levels considered harmful to important food sources for fish, birds and other animals, such as midges and mayflies. Researchers hope a total ban such as the one France will soon introduce, may reverse "neonic" readings there, over time. But, despite a partial moratorium imposed by the EU a few years ago, readings in Europe are still among the highest. The report warns that "pesticide cocktails," where more than one "neonic" compound may be used at once, "may increase harm" even more. 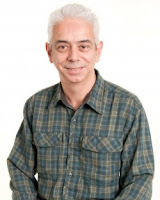 The researchers, headed by Edward Mitchell of the University of Neuchâtel, Switzerland, call on authorities to tell the public more about how many pesticides are being used in their areas, and to make that information more clearly and easily understood. Reaction to this new research from other experts in the field, has been swift and, in some cases, angry. Dave Goulson, Professor of Biology at the University of Sussex (above) laments, "Despite repeated warnings from scientists that they are impacting the bees, butterflies, aquatic insects and more...few governments have listened. Entire landscapes all over the world are now permeated with highly potent neurotoxins, undoubtedly contributing to the global collapse of biodiversity. "Some of us have been pointing this out for years. It is hard not to feel a sense of deja vu: Rachel Carson was saying the same things more than 50 years ago, but we seem not to have learned any lessons. It is high time that we developed a global regulatory system for pesticides, to prevent such catastrophes being repeated over and over again." Meanwhile, Chris Connolly of the University of Dundee, Scotland (above), calls these latest findings “Alarming and sobering." He says "neonics" are being overused, unnecessarily and ought to be "heavily restricted." This is unsettling news, indeed, since it's often been said that "One out of every three spoons full of food we put in our mouths are made possible by pollinators!" This latest research was published in the journal, "Science" on Thursday. Journalist Rebecca Skloot deserves credit for investigating the human story behind immortalized cell lines. Her Pulitzer prize winning book “The Immortal Life of Henrietta Lacks” delves into the life of a woman whose cancerous cervical cells were used to establish the ‘HeLa’ cell line-the line used for most cancer research done today-without her knowledge or consent. The book humanized the woman whose cells have become immortalized in science, but also highlighted the ethical and legal complexities of using biological tissues in research. These are challenging moral and philosophical questions that legal experts are currently debating. I cannot comment on what ethical and legal frameworks were in place when the boy’s cells were extracted, and the THP-1 cell line established. I can tell you that in Canada, upon the parents’ request, the existence of THP-1 cell line would be disclosed. Additionally, the parents could withdrawal their consent for the cells being used in research. Whether there is an obligation for researchers to disclose this information without the donor’s request is being debated. The profits from a commercial cell line would likely not be shared with the donor. I can tell you that in Canada, research involving human biological tissues involves intense scrutiny via the research ethics board, and similar protocols are in place in other countries. While it varies from country to country, human tissue-based research operates under the core principles of respect for human dignity, informed consent, patient privacy & confidentiality, minimizing harm, and maximizing benefit. Chelsea Matisz is a PhD Candidate at the Faculty of Medicine, Department of Physiology and Pharmacology, University of Calgary, AB, Her website is: sciencesoup.net. Peaches and nectarines are the same fruit minus a small genetic variation that makes nectarines hairless. When I first learned this little trivia tidbit I wondered about the difference in flavour. I prefer nectarines to peaches, but wondered if the taste difference was all in my head. Well, it’s not. The genetic variation affects flavour, aroma, size, shape and texture. While the rough location of the genetic change has been known for some time, the exact gene and the exact change in the DNA sequence of “nectarineness” has been a mystery. In March, scientists from Italy finally identified a disruption in a “fuzz” gene that is absent in peaches. Darwin, and others, deduced that the nectarine was a peach variety. In 1933, scientists determined a recessive gene variant was responsible for the inheritance pattern of the nectarine's hairless (glabrous) skin. The glabrous trait was given the designation G, with big G for the normal fuzzy peach character and little g for the glabrous nectarine character. Each fruit has two copies of this gene. Each parent gives one to the offspring fruit, which can be either GG, Gg, or gg, and only the gg fruits are nectarines. The chromosomal location of the G trait was already roughly landmarked but the Italian research team zoomed in on the spot, sort of like how you zoom in to street view with Google maps. Many DNA sequence differences exist between nectarines and peaches that are not located in genes but are useful as landmarks along the chromosomes. These are called genetic markers. To zoom in on the G trait, the researchers crossed peach and nectarine trees and followed the offspring through two generations. The offspring had a mixture of peach and nectarine markers along their chromosomes but certain genetic markers, the ones closest to the G trait location, always went along with the nectarineness. These genetic markers landmarked the region to search for genes with mutations that could explain a nectarine’s fuzz-less-ness. Within the landmarked region, the researchers identified a disrupted gene. The peach to nectarine gene disruption is a genetic modification by the hand of Mother Nature, an insertion of a transposable element. This type of DNA element can move because it contains its own code for the production of an enzyme that can “cut”and “paste” the transposable element to other locations in the genome. Transposable elements can get pasted right in the middle of genes, disrupting the DNA sequence. They are a known cause of genetic variation in plants. If you like chardonnay wine, you can thank a transposable element for disrupting the cabernet grape genome long ago. In nectarines the transposable element stuck itself right in the middle of a gene called PpeMYB25. Genes with similarities to PpeMYB25 in other plants are important for making plant hair, called trichome, which can occur on the stem, leaves, flowers and fruit of plants. The PpeMYB25 gene is the recipe for making a protein that is a transcription factor, a type of protein that controls when and how much other genes are turned on, so a mutation in this one gene could explain not just baldness in nectarines but other nectarine characteristics as well, depending on what these other genes are that it controls. In this report the researchers focused on the peach fuzz characteristic. When they looked at flower buds during the period when fuzz or trichome first develops, they found PpeMYB25 to be active in the peach but not the nectarine buds. This is the first description of a specific genetic modification that can explain the difference between peaches and nectarines, something that has long been a mystery. This research makes a strong case that nectarine lack of fuzz is due to the inability of nectarines to produce the PpeMYB25 protein. How lack of PpeMYB25might lead to the other nectarine characteristics — flavour, for instance — still needs to be worked out. Darwin, C. (1868) The Variation of Animals and Plants Under Domestication, Volume 1, pg 363. Peach flower, fruit, seed and leaves as illustrated by Otto Wilhelm Thomé (1885) public domain via Wikimedia Commons. Nectarine Fruit Development by jjron - Own work. Licensed under CC BY-SA 3.0 via Wikimedia Commons. I spent much of the summer researching a new kids’ science book. (Sorry – can’t get specific yet.) It’s about a very hot research topic – so hot that fresh stories seemed to hit the news every other day all summer long. If you’re writing one of those news stories, it’s exciting. You can get your story out in days, if not hours. If you’re writing for a magazine or another long-form medium, you have a problem. Your story might not appear for a couple of months or even longer. That means you have to dig deeper into the background of the story and give your readers the tools to evaluate the hot-off-the-press news stories that will continue to crop up. But pity the poor book writer! The authors of non-fiction books can spend years researching their topics, reading the literature, interviewing experts in the field, grappling with the complexity and implications of the topic. And that’s just the beginning. The process of editing, designing, proofing, printing, and publishing usually adds at least another year to the process. I write science books for kids, and that gives me an advantage. The books are shorter, so the turn-around time is faster. Still, the book I’ve been working on since late last spring won’t hit the shelves until next fall. And that’s a long time for a hot topic. Still – you have to try, even if you’re writing for kids. Maybe especially if you’re writing for kids. They are the scientists and science-consumers of tomorrow, and they need the best, most accurate information writers can give them. Kids’ science writers generally try very hard to provide that. And sometimes that relatively short lead time for kids’ books works to our advantage. A few years ago, I spent months researching material for Traitors’ Gate and Other Doorways to the Past, a book for kids aged 10 to 14 on the history of eight different buildings around the world. One of the doorways was the grand entrance to the Treasury, or Al Khazneh, in Petra, Jordan. You’ve probably seen it. In the movie Indiana Jones and the Last Crusade, when Indy dashed up a wide stone stairway and through the imposing doorway of the Grail Temple, he was really dashing up the steps and through the entrance of the Treasury. In this 2010 photo of the Treasury, the grating covering the 2003 excavations is visible to the left of the great door. Photo by Arian Zwegers, Creative Commons Attribution 2.0 Generic Licence. Of course, there’s no Grail Temple on the other side of the door – just a big empty room carved into the red-stone cliff. Both room and façade were created by the Nabateans, who controlled the desert trade routes for several centuries until the Romans took control of Petra in 106 CE. The Nabateans built the Treasury about 2000 years ago, and the circumstances of its building and its purpose were lost in time. In 2007, when I was researching my book, the best source of information was Jane Taylor’s beautiful 2002 book, Petra and the Lost Kingdom of the Nabateans. The author listed the most common speculations about the purpose of the Treasury, and the reasoning behind them. That should be enough, you’d think. After all, I was writing a single chapter in a book for kids – 20 short pages at most, with lots of pictures. The trouble is, you have to be sure. So I searched academic journals, trawled the Internet, and poked through proceedings from archaeology conferences. Although the journals produced nothing new, the Internet kept throwing up tantalizing references to recent excavations. But – no journal articles, no first-hand accounts, no contact information. Finally, I searched for email addresses under the names I’d identified and sent messages to all of the addresses in the hope that one would connect. It did. Dr. Suleiman Farajat of the University of Jordan and the Petra Archaeological Park responded and kindly sent me a draft report with the information I needed. In the summer of 2003, with tourism in Jordan all but dead because of political tension, Jordanian archaeologists had done some long-delayed excavating in front of the Treasury, where ground-penetrating radar suggested there was something interesting. And indeed there was. The broad steps and huge entry were not, it turned out, the base of the structure. They were, in fact, one storey up. Beneath them, buried in millennia of flash-flood debris, was an entire storey – tombs, some still holding skeletons and the remains of offerings to the dead. 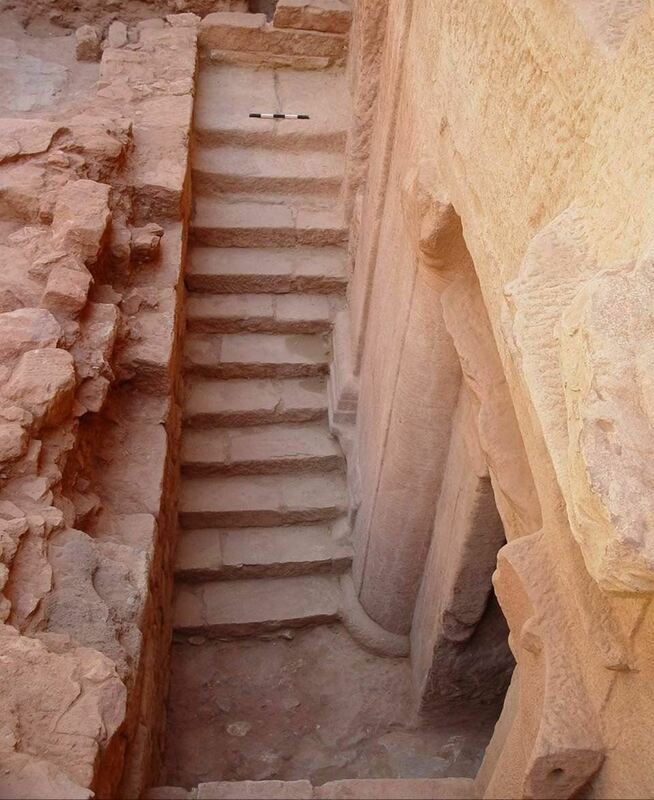 The 2003 excavations revealed this narrow stairway leading down to the tombs that once formed the main-floor level of the Treasury. Photo courtesy of Petra National Trust. The mystery of the Treasury – still a mystery in the 2002 book – was a mystery no more. 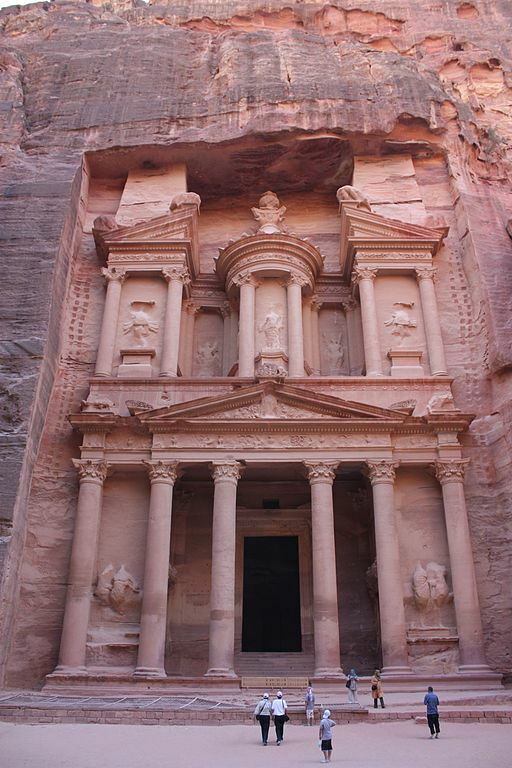 The Treasury was a mausoleum built to honour the royal family of Petra and to awe and impress visitors. Its grand entry had once loomed metres above the heads of visitors and worshippers, who filled the plaza beneath it with the smoke of their offerings and the murmur of their prayers. When Traitors’ Gate and Other Doorways to the Past – a book for kids – came out in 2008, it was the only publication with that new information, apart from a print-only annual report on excavations that was shelved in a library in Jordan. And that remained true for a couple of years, until the rest of the publishing world caught up. Sometimes, all those awkward timelines just work out right. 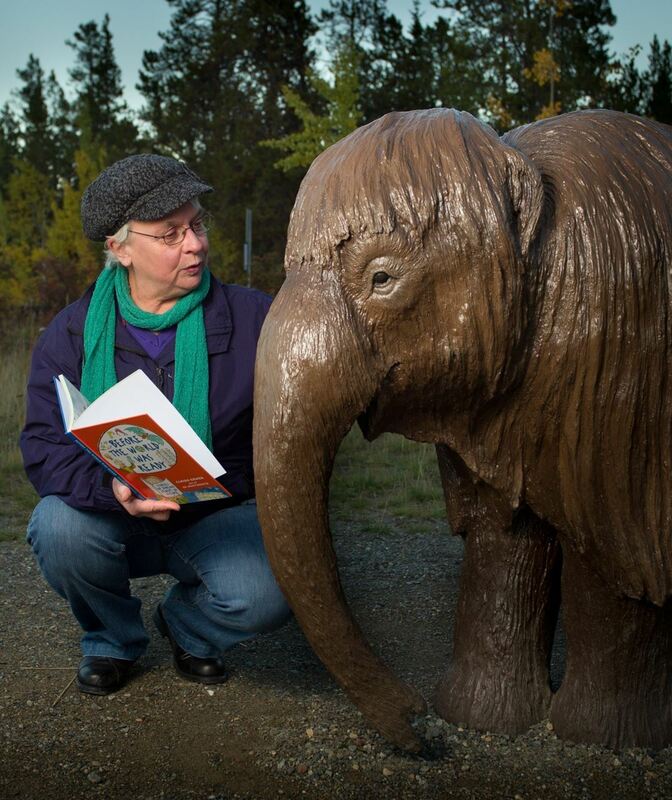 Claire Eamer is a BC-based science writer who writes popular science articles and books for both kids and adults, as well as writing and editing major scientific reports for international science-based organizations. If you have posted a guest blog with us in the past, rest assured it's been archived and saved as an html document and will be posted here as soon as it's cleaned up. If you need your copy right away contact Janice at the office and she'll get it to you in html form asap. Also contact Janice if you're able to clean up your own html for reposting, and perhaps you would be willing to help prepare other posts for reposting as well?